Update on the UN investigation of the UK Government, which found evidence of grave and systemic violations to Disabled people’s rights in the UK under welfare reform since 2010. At the end of 2016 the United Nations published a report which found evidence of grave and systematic violations of Disabled people’s rights by the UK government due to welfare reform. The report was published in the same week as the US presidential elections and for a finding of this magnitude received too little media attention. The government rejected all of the UN findings and there are no plans to discuss the report in Parliament. On 24th January 2017, Disabled People Against Cuts and Inclusion London held a briefing event in Parliament for MPs and members of the House of Lords. Chaired by Baroness Deech with speakers: Louise Whitfield, Disability Justice Project solicitor; Rachel Fox, Equality and Human Rights Commission; Linda Burnip, Disabled People Against Cuts; Tracey Lazard, Inclusion London; Jamie Burton, Just Fair; Debbie Abrahams, shadow Secretary of State for Work and Pensions; Jonathan Bartley, co-leader The Green Party; Cori Wilson, SNP; Heidi Allen, Conservative Party. On 7 November 2016 the United Nations published the findings from a UK inquiry carried out by their disability committee under Article 6 of the Optional Protocol of the Convention on the Rights of Persons with Disabilities (CRPD). The inquiry was triggered by extensive evidence submitted to the UN over a number of years by ordinary people concerned by the impact of UK government policy on Disabled people. 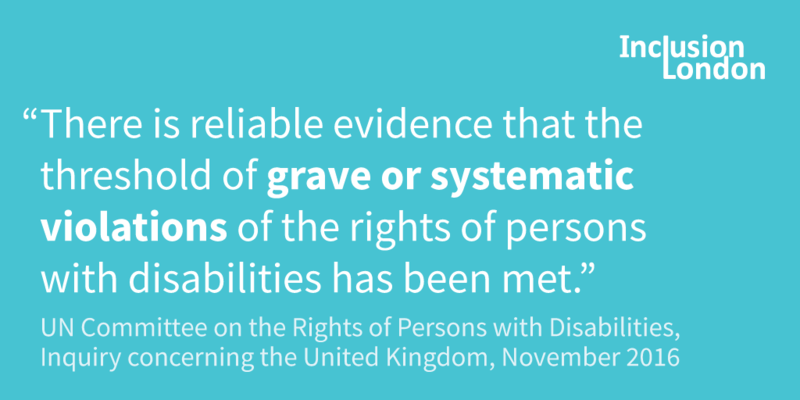 It is the first time a state has ever been investigated in this way and the UK is now the first state in the world of whom the UN has found reliable evidence of grave and systematic violations of Disabled people’s rights. The inquiry report was published alongside the UK government response to the findings, rejecting all eleven of the UN recommendations. Critics of the inquiry point to discrimination and the terrible living conditions to which Disabled people in other parts of the world are subject. However, by ratifying the CRPD, the UK government signed up to the progressive realisation of social and economic rights. The UN inquiry investigated and found evidence of systematic and serious retrogression of Disabled people’s rights due to welfare reform. This supports concerns raised separately by the UN Committee on Economic, Social and Cultural Rights, and the UN Special Rapporteurs on Housing, Disabilities, Poverty and Food. On March 13th and 14th 2017, Reclaiming our Futures Alliance (ROFA) were in Geneva to give evidence at the UN. ROFA, an alliance of Disabled people and organisations including Inclusion London, collected lived experience evidence from thousands of Disabled people to write an English Shadow Report to the UK Government’s account to the UN. With Disabled People against Cuts, we also wrote a 70 page response to the Inquiry and the UK Government response, detailing our serious concern at the Government’s approach.